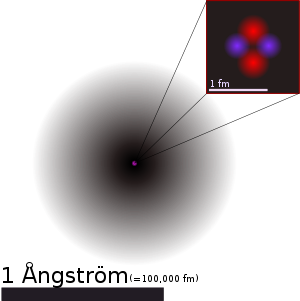 An illustration of the helium atom, depicting the nucleus (pink) and the electron cloud distribution (black). The nucleus (upper right) is in reality spherically symmetric, although for more complicated nuclei this is not always the case. The black bar is one ångström, equal to 10−10 m or 100,000 fm. Atomic physics (or atom physics) is a field of physics that involves investigation of the structures of atoms, their energy states, and their interactions with other particles and electromagnetic radiation. In this field of physics, atoms are studied as isolated systems made up of nuclei and electrons. Its primary concern is related to the arrangement of electrons around the nucleus and the processes by which these arrangements change. It includes the study of atoms in the form of ions as well as in the neutral state. For purposes of this discussion, it should be assumed that the term atom includes ions, unless otherwise stated. Through studies of the structure and behavior of atoms, scientists have been able to explain and predict the properties of chemical elements, and, by extension, chemical compounds. The term atomic physics is often associated with nuclear power and nuclear bombs, due to the synonymous use of atomic and nuclear in standard English. However, physicists distinguish between atomic physics, which deals with the atom as a system consisting of a nucleus and electrons, and nuclear physics, which considers atomic nuclei alone. As with many scientific fields, strict delineation can be highly contrived and atomic physics is often considered in the wider context of atomic, molecular, and optical physics. As noted above, atomic physics involves investigation of atoms as isolated entities. In atomic models, the atom is described as consisting of a single nucleus that is surrounded by one or more bound electrons. It is not concerned with the formation of molecules (although much of the physics is identical), nor does it examine atoms in a solid state as condensed matter. It is concerned with processes such as ionization and excitation by photons or collisions with atomic particles. In practical terms, modeling atoms in isolation may not seem realistic. However, if one considers atoms in a gas or plasma, then the time scales for atom-atom interactions are huge compared to the atomic processes being examined here. This means that the individual atoms can be treated as if each were in isolation because for the vast majority of the time they are. By this consideration, atomic physics provides the underlying theory in plasma physics and atmospheric physics, although both deal with huge numbers of atoms. Electrons form notional shells around the nucleus. These electrons are naturally in their lowest energy state, called the ground state, but they can be excited to higher energy states by the absorption of energy from light (photons), magnetic fields, or interaction with a colliding particle (typically other electrons). The excited electron may still be bound to the nucleus, in which case they should, after a certain period of time, decay back to the original ground state. In so doing, energy is released as photons. There are strict selection rules regarding the electronic configurations that can be reached by excitation by light, but there are no such rules for excitation by collision processes. If an electron is sufficiently excited, it may break free of the nucleus and no longer remain part of the atom. The remaining system is an ion, and the atom is said to have been ionized, having been left in a charged state. Most fields of physics can be divided between theoretical work and experimental work, and atomic physics is no exception. Usually, progress alternates between experimental observations and theoretical explanations. Clearly, the earliest steps toward atomic physics were taken with the recognition that matter is composed of atoms, in the modern sense of the basic unit of a chemical element. This theory was developed by the British chemist and physicist John Dalton in the eighteenth century. At that stage, the structures of individual atoms were not known, but atoms could be described by the properties of chemical elements, which were then organized in the form of a periodic table. The true beginning of atomic physics was marked by the discovery of spectral lines and attempts to describe the phenomenon, most notably by Joseph von Fraunhofer. The study of these lines led to the Bohr atom model and to the birth of quantum mechanics. In seeking to explain atomic spectra, an entirely new mathematical model of matter was revealed. As far as atoms and their electron arrangements were concerned, formulation of the atomic orbital model offered a better overall description and also provided a new theoretical basis for chemistry (quantum chemistry) and spectroscopy. Since the Second World War, both theoretical and experimental areas of atomic physics have advanced at a rapid pace. This progress can be attributed to developments in computing technology, which have allowed bigger and more sophisticated models of atomic structure and associated collision processes. Likewise, technological advances in particle accelerators, detectors, magnetic field generation, and lasers have greatly assisted experimental work in atomic physics. This page was last modified on 6 December 2016, at 00:06.